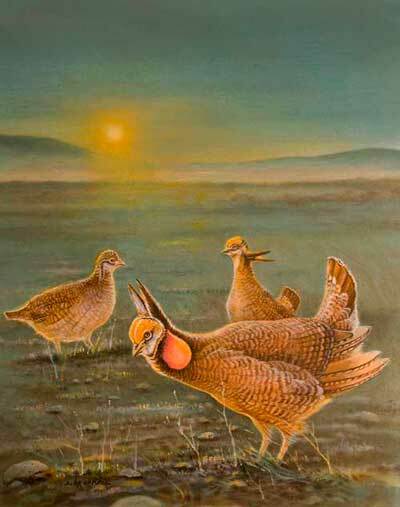 SANTA FE -- Belen artist Susan Brooke's oilpainting of lesser prairie chickens at sunrise was chosen as the winner of the 2010 High Plains Lesser Prairie Chicken Festival poster contest. Brooke will receive the $300 first-prize and her work will be reproduced as the annual poster for the festival, which will be April 16-18 in Milnesand, N.M.
Kambrey Blakey, 12, of Portales, won the category for grades K-5, and Lauren Bennet of Corrales won the grades 6-12 category. Both youths will receive $50. The festival is limited to 100 participants because of the sensitivity of the lesser prairie chicken during breeding season. This year's event is sold out, but those interested in attending next year's festival can receive early notification by calling Tish McDaniel, (575) 762-6997 or e-mailing chickenfestival@yahoo.com. SANTA FE -- The Department of Game and Fish is beginning a biennial review of its state listings of threatened and endangered species under the Wildlife Conservation Act and will begin accepting public comments from March 24 through June 21. The Biennial Review of species status is required by state law. The current list, adopted by the State Game Commission in 2008, includes 119 threatened and endangered wildlife species, plus seven restricted non-native species. The Biennial Review process determines whether wildlife species will be "uplisted" from threatened to endangered, "downlisted" from endangered to threatened, or remain unchanged in the listings. Adding or removing a species from the state list requires a separate process. Listing decisions are based on biological and ecological factors. Social, economic and political considerations noted during the review can be used in the implementation of conservation and recovery actions after a species is listed. The Wildlife Conservation Act contains no provisions for critical habitat, habitat regulation or other restrictions regarding state-listed wildlife except to prevent direct taking of the species. Public comments regarding species listings will be presented at the July 8 Commission meeting in Silver City. A second, 14-day comment period will follow the meeting and precede the final draft recommendations to be presented to the Commission. The Biennial Review can be reviewed on the Department's Web site, www.wildlife.state.nm.us; or obtained by mail, New Mexico Department of Game and Fish, 1 Wildlife Way, Santa Fe, NM 87507; or by e-mail, dave.holdermann@state.nm.us. Comments will be accepted by e-mail or regular mail.